Action Theater Improvisation trainings integrate movement, vocalization and speech into present expression. 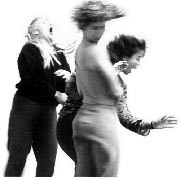 The practice of Action Theater incorporates the disciplined exploration of embodied exercises that lead to increased skills of strong, clear, spontaneous, and artful communication.Action Theater addresses and expands the vocabularies of expression including: movement, vocalization, and speech. Action Theater is a tool to examines one's perceptive and responsive process, bringing awareness to and thereby disempowering distracting thoughts of self obsessions, fears, judgments and analysis.